The Politicization of European Inflation Has Begun Ready! Fire! Aim! The German statistical agency today reported the annual average of German inflation featuring that metric over the usual fourth quarter to fourth quarter measure because it made for a more dramatic result. 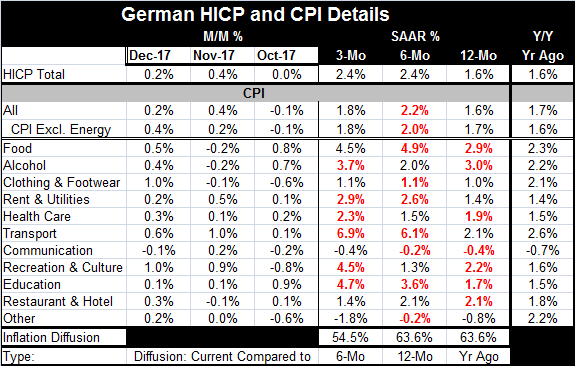 December to December both HICP and German CPI inflation rates are lower although the core CPI is slightly higher in 2017 than in 2016. We are talking by one tenth of one percentage point. Destatis wrote: "Consumer prices in Germany rose by 1.8% on an annual average in 2017 compared with 2016. The increase was above the relevant levels of the past four years. Between 2014 and 2016, the year-on-year-rates of price increase were even below one percent each." Economists like to use December to December or Q4 to Q4 changes on inflation or growth (or whatever) because it speaks more to what is happening on the cutting edge of a process. When the average is taken of the CPI and compared to the average of the CPI for the year earlier, a lot may be going on in the last six months of the current year that the annual average comparison does not tell you. In this case, the Germans are looking to put their inflation in the worst light possible to give credence to the argument that the ECB needs to get off the stimulus path and start to normalized policy and to hike rates. But the truth is that the ECB will make policy off of EMU inflation not German inflation, however measured. And Germany's own inflation data show that its CPI- total as well as ex-energy- is losing lift over three months compared to six months. And its 12-month inflation rate measured by core or headline is still below 2%. The German HICP data show slightly more adverse inflation trends over three months and six months than the German domestic CPI. Both show a gain of 1.6% over 12 months, but the HICP logs gains at a flat 2.4% pace over six months and three months while the CPI logs a 2% gain over six months that steps down to a 1.8% gain over three months. On the domestic measure, inflation is both lower and decelerating. But the German statistical agency, Destatis, chose to highlight the year(average)-over-year(average) domestic measure, the measure that actually has the more benign pattern for inflation in the second half of 2017. The agency also produces a graphic of year-over-year inflation with a guideline at 1.8% that seems to make all inflation higher than 1.8% excessive. The ECB's target mandate for EMU inflation is for a pace just below 2%. Comparing inflation tendencies across major categories, the diffusion metrics in the table below show inflation acceleration tendencies over the last 12 months compared to a year ago as well as for six months compared to 12 months and for three months compared to six months. On all three horizons, the diffusion reading are above 50 which indicates that more categories (without regard to weighting) are experiencing accelerating prices than are experiencing decelerating prices. But actual CPI inflation only increases on one of those horizons - that is over six months compared to one year ago. On balance, there is some evidence of vapor-like inflation pressures. However, only the Germans would be pushing panic buttons over the sorts of inflation processes we see here. CPI Inflation is threatening to get closer to 2%. But all year-over-year measures, the usually emphasized metrics, show inflation is still well in bounds and even decelerating. Activity has picked up to some extent and some of the PMI data for Germany as well as for the EMU have been strong-looking. But the PMI data have shifted and now seem to exaggerate what they measure. But you will find differing opinions on this. We are definitely and firmly ensconced in the policy decision zone where policy will be made by individuals making judgement calls. What we learn from the Germans early on is that the Germans want to refer to data in a way that skews the case in the direction that they want to move policy. This is always dangerous. Policy decisions should matriculate up from data observation; our observations should not be colored to promote a policy that dogma dictates. So be careful to vet every argument you hear and to be aware of exactly who is making the argument. In this part of the policy cycle, you can't understand anything that is being said without a score card. And everyone has skin in the game.